the “abaniko” style is a style of fighting, which is what people call the close range, or pikiti tirsia or corto mano to some. to many of the old men you meet, other than that group of manong in stockton, you will hear them talk about the “abaniko” style, which is also the only style of eskrima i know completely. abaniko/pikiti tirsia is not a style you can get rank in or learn from beginning to end like any arts. 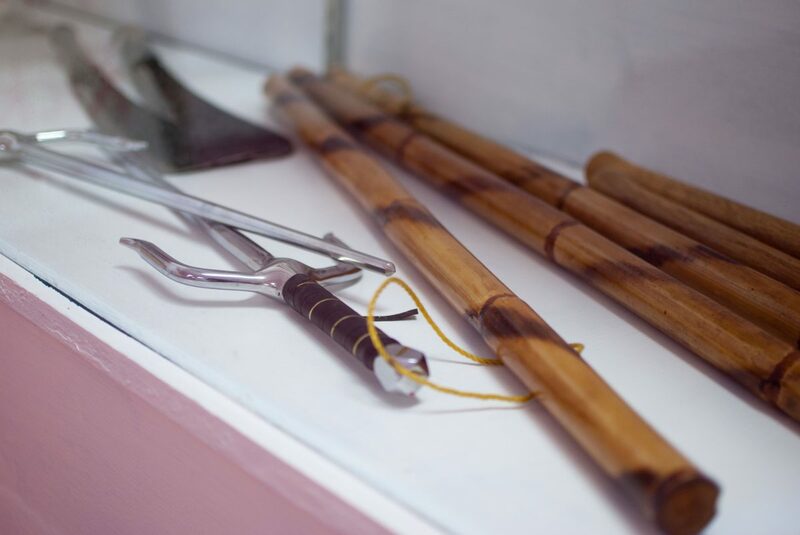 the abaniko may be one of many styles of fighting inside your own style, and they are terms familiar to visayan styles of eskrima. each style has a specialty and a purpose. and your style of fighting is made up of many styles of eskrima fighting or just two or three. anyway, the abaniko style is not design to be used for a long time in the close distance where an abaniko is used best. you use it when the oponnent is close and he is not trying to grab your legs. the opponent can be trying to tie up your hands and arms, disarms you or maybe he just wants to hit you. but when you use this abaniko method, you use it very quickly to confuse your opponent, put a few hurtings here and there, and set him up for a major power hit that can end that fight. * the opponent should not be able to tie your arm from your elbow to the shoulder with his own arm. a grab or push is okay. * you should explore all the ways your hit can make it through when your arm is grabbed or trapped or pushed. the rule is, when any joint is free, your wrist or the elbow, you have a hit. * it is better to shift your hitting arm away from the opponent side. this means you put your free hand/shoulder forward while you are fighting even if you were the other way around first. the easy way to do this is to step away with the foot on the same side that your have your stick or knife. you can step back or outside of your enemy. * when the opponent closed into your attack zone, your first move is to put your free hand between you and the opponent while you free the weapon hand. you should try to make your free arm almost straight at the elbow, but then you should know where it is your weapons hand and what part of the opponent is near him. * you can hit the opponent from his left side or his right, no matter what hand your weapon is in. how do you do this? be able to look him in the eye and know where all this hands and knees are so you know where to move the hand (you can bring the hand under or over his arm or your arm). the best time to hit him is while he is fighting to get your weapons hand. if you understand this rule, you wont be disarmed. * learn to create power from any postion with even the smallest distance to start from. your enemy will not look at you while your stick has just smacked him in the face nose eyes cheekbones or whatever. his eyes will close and he will turn his head even for only 1 or 2 seconds. that is enough time to land a bone breaking hit from any position without a wind up. i will continue this long post next. when the opponent is closing in, he wants to do three things, to grab you and throw you to the ground, to grab your stick and take it (or stop you from hitting you), or to tie up your hand so you cant strike or cut anymore. so, the first thing we do is to protect that hand. the free hand stops him from wrapping the arms around you. while you do that let your stick hand move around so he can grab it-maybe you witik the hand he’s reaching to you with. at the same time you move your legs off his line of movement (the straight line where his butok is pointed, ask a pilipino what is a butok) take your legs off that line, which is the only place he is really dangerous to you (not because he might pee on you, do you get it now?) this will force the guy to change his direction, disrup his balance, and change his mental plans for you. next if there is a positon, you can blast him in the head with your stick. if he is still fighting you for superior position, continue to hit him with the stick hand but always changed the direction its coming from (this is why we use the fan-style hit because he wont know where you will hit by looking at your hand) my favorite quick hit is to straight my arm 45 degrees to my right and use the inside abaniko hit to his head or hand. when he react to that i quickly drop my hand and hit him low with a witik (HIT, not fan style snap) when his attention is low and he reacts to that by this time i stepped off his line already, my free hand was searching for a hooking or grabbing position (he didnt know because his mind was on my weapon) and i only took 1/2 a second to bring it back up, now i have a power shot with my opponent one second/one hit behind me. the main thing to remember is this hit can knock out a guy if you are lucky, but thats not what they designed it for. it is a quick way to get to superior positon, distract him while you move your feet. quickly hit two or three target in one second, then trap him with the free hand for a power hit. i wrote all this because lately i met many arnisadors and eskrimador who said the abaniko is useless and they “trim the fat”. well, maybe the guy who taught them had lots of fat, but the technique is one important part of arnis he should know. it is more than a cute overhead hit but its a style you must know how to use it if the hit will be any good to you. other than that he is just collecting foreign books but didnt learn the language yet.